Four satellites set to join O3b’s expanding broadband network successfully launched Friday on top of a Russian-built Soyuz booster from French Guiana, joining 12 other craft linking developing nations, far-flung islands, cruise ships and other hard-to-reach locales with the Internet. Mounted on a carrying dispenser inside the Soyuz rocket’s nose cone, the four O3b spacecraft will grow the satellite-based broadband network’s reach and coverage, answering demand for more bandwidth from the initiative’s current and prospective customers. The satellites lifted off at 1710:06 GMT (12:10:06 p.m. EST; 2:10:06 p.m. French Guiana time) from the Guiana Space Center, a spaceport carved from the edge of the Amazon rainforest on the northeastern coast of South America. A Soyuz-2.1b rocket pushed the O3b payloads into a mostly sunny sky after 33-minute delay to allow for improved wind conditions aloft. 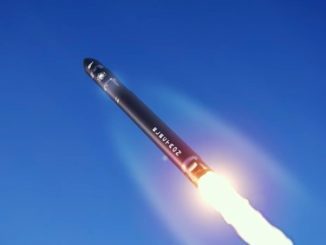 The Soyuz booster pitched on a downrange trajectory east from the European-run space center, and dropped four kerosene-fueled first stage boosters into the Atlantic Ocean around two minutes after liftoff. 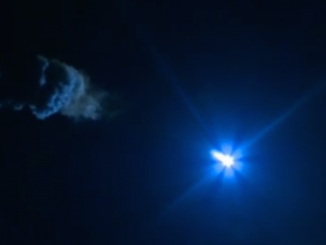 Engines on the Soyuz core stage and third stage fired in succession, and a Russian Fregat upper stage ignited to place the O3b satellites into a preliminary parking orbit. Two more Fregat upper stage burns placed the O3b payloads close to their targeted deployment altitude of 4,865 miles (7,830 kilometers) above the equator. The first pair of O3b satellites released from the Fregat upper stage at 1911 GMT (2:11 p.m. EST), followed by a brief rocket firing to move to a nearby position for separation of the other two spacecraft at 1932 GMT (2:32 p.m. EST). Officials confirmed all four satellites, built by Thales Alenia Space, established contact with ground teams a few minutes later. The reception of telemetry verified the spacecraft were in the correct orbit and healthy following the launch. 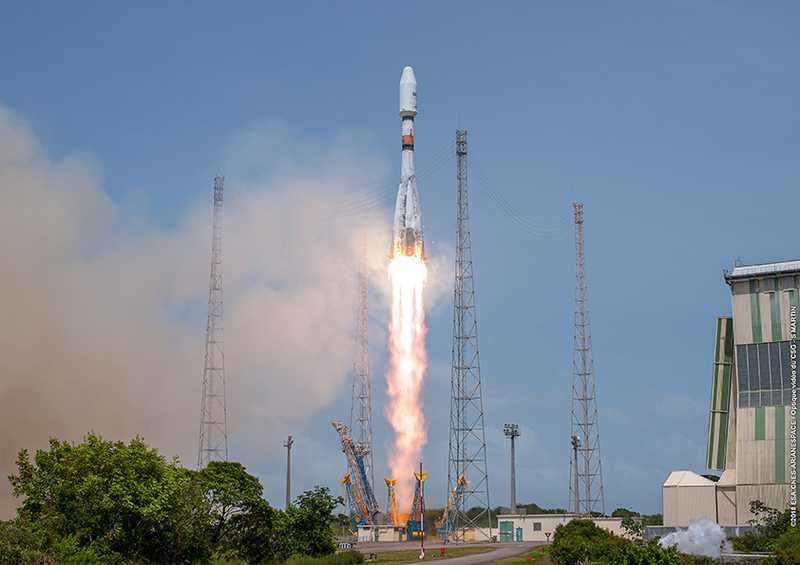 Arianespace, the French company in charge of Soyuz launch operations at the Guiana Space Center, declared the mission a success. “Arianespace is delighted to announce that the four O3b satellites have been safely separated as planned in their targeted Medium Earth Orbit,” said Luce Fabreguettes, the launch company’s executive vice president for missions, operations and purchasing. Friday’s launch was the 18th time a Russian Soyuz rocket has lifted off from French Guiana since October 2011, and the 1,885th flight by a Soyuz rocket variant overall. The flight plan for the satellites called for each craft to extend its power-generating solar panels, then complete a series of in-orbit checks. The spacecraft will slightly raise their altitudes to join the other 12 satellites in the O3b fleet, then enter commercial service by mid-May. The four new satellites join 12 others launched on three previous Soyuz rocket flights from French Guiana in 2013 and 2014. 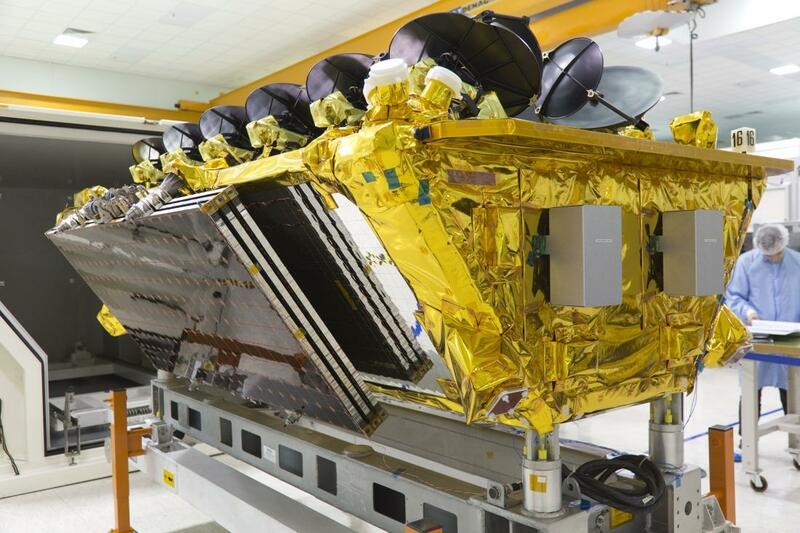 SES completed the purchase of 100 percent of O3b Networks’ ownership in 2016, soon after O3b ordered eight additional satellites from Thales Alenia Space in response to growing demand. The next four O3b craft will launch on another Soyuz mission from French Guiana in early 2019. The O3b satellites carry Ka-band broadband beams to relay high-speed Internet connectivity to far-flung communities, industrial facilities and mobile users. “From connecting underserved communities and meaningfully transforming lives through improved broadband access, to delivering state of the art satellite-enabled network services to ships, planes and government platforms, our O3b fleet offers unique and differentiated performance and is driving our customers’ businesses forward,” Collar said in a press release. The O3b network provides connectivity to conventional Internet Service Providers, governments, schools and universities, remote factories, oil and gas platforms, humanitarian missions, resorts and the maritime industry, including luxury cruise ships owned by Royal Caribbean. The O3b satellites fly in a medium-altitude orbit more than four times closer to Earth than the geostationary belt more than 22,000 miles (nearly 36,000 kilometers) over the equator, where most large telecommunications craft reside. That reduces the latency of an Internet connection established through the O3b satellites, or the time required for a user to send a request and get a response. The idea behind O3b, which was named for the “Other 3 billion” people without reliable Internet access, was to use satellites to link places difficult to reach with terrestrial fiber networks. From Medium Earth Orbit, the O3b satellites cover a swath of the planet ranging between approximately 45 degrees north and south latitude. 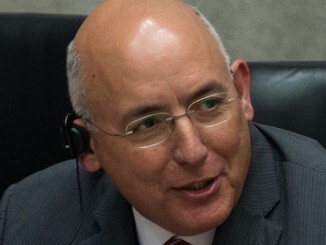 SES Networks says the O3b network has beamed Internet signals for the U.S. Department of Defense and the United Nations, and provided connectivity to numerous island nations: Palau, Micronesia, Kiribati, Nauru, Papua New Guinea, the Solomon Islands, Vanuatu, the Cook Islands, East Timor and America Samoa. African markets have also taken up O3b usage, with Internet services beamed to Chad, South Sudan, Somalia, the Central African Republic, the Democratic Republic of the Congo, Cameroon, Angola and Madagascar. The Galapagos Islands and Easter Island have also received Internet services through the O3b satellites, along with parts of Peru and the Amazon basin in Brazil. The satellites launched Friday will add 38 percent to O3b’s broadband capacity, officials said. 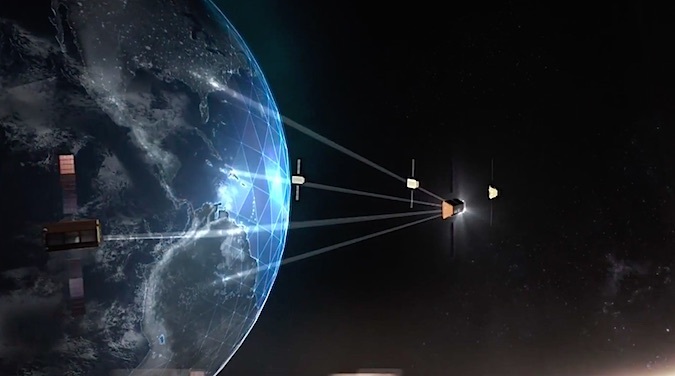 They also debut an improved antenna design and a better encryption standard, offering a performance upgrade over the original 12 O3b satellites. “There’s not one segment that’s really driven us to do this,” said John-Paul Hemingway, executive vice president of product, marketing and strategy at SES Networks. “All the (market) segments are doing well, but we just needed more capacity. We have actually pre-sold some of this capacity, but there’s a lot more capacity available with this (additional) 38 percent to react to customer growth. “Of course, we’re very positive about that because we are planning to launch another four satellites within the next 12 months, some time in the first half of ’19,” Hemingway said in a phone interview with Spaceflight Now. SES last year announced an upgraded network that will begin launching in 2021. The O3b mPower fleet will consist of seven satellites built by Boeing that will launch into the same roughly 5,000-mile-high (8,000-kilometer) orbit currently occupied by the first-generation O3b satellites. Once operational, the O3b mPower network will reach many more parts of the world, meeting the entire data traffic needs of some small countries, SES officials said when they unveiled the program in September. Billed as the first “multi-terabit” satellite constellation, O3b mPower will multiply the capability of the current-generation O3b fleet. Each O3b mPower satellite will carry 4,000 Ka-band beams, up from 10 on each of the current O3b spacecraft.